There are seven six-foot windows in my great room, four on the long wall, that I am facing, and three on my left side. As I sit here the afternoon sun is shining through new green leaves on a lot of trees and it is beautiful, this has been a perfect day for anything but since it’s Resurrection day it seems even more so. As an aside I will tell you that this is the first Easter in my whole life that I was not in church and that includes the Easter Sunday we had all caught “pink eye” from one of the church member’s children. I played the organ and sang that Sunday looking a lot like Ray Charles with very black sunglasses on my face! Back to today, the Braves are on the verge of snatching defeat from the jaws of victory, bottom of the tenth with one on base for the Mets. Dinner was good and the dishwasher is full and running so I am feeling that I have the right to just sit and ruminate for a few. As my memories of Easter in the past bubble up one by one I first see myself with a little white purse which matched my white patent-leather shoes and frilly white dress, black curls glossy from all the brushing my mother gave them all while telling me as I squirmed in pain, “Suffer for beauty’s sake, Leenie.” Well “Leenie” wasn’t caring enough for beauty to have her scalp yanked out by her over-zealous mother! I remember the Easter right before my brother was born that my parents were holding a revival in Charleston, SC. Daddy had rented a space in a trailer park so we could be connected to power, however there was no toilet in that little trailer so my mother, who was a very sick pregnant lady and couldn’t keep anything on her stomach, made use of the pot which my dad so diligently carried out and kept clean. That Easter I shared my Easter basket with a little boy that I was just madly in love with and I am friends with him to this day. When I was fifteen there was the Easter the lady in the church with very good intentions decided to make an Easter dress for me, oh how I did not want her to do that! She hauled me down to the basement of the beautiful church we shared with St Luke’s Lutheran, and took my measurements much to my great horror! Wearing that dress was one of the single most embarrassing days of my life! I had no choice of color or material so when I put on that bright pink dress made of some sort of stiff linen, complete with a wide belt that had a mother-of-pearl buckle, I felt completely humiliated. It didn’t fit me well and all I wanted to do was to go back into that church basement and hide! By the next year someone else took mercy on me and decided to take me shopping, now shopping is not one of my favorite things but I can tolerate it with someone I like and here I am going to break one of my own rules, the one about never calling anyone’s name, because the person was the mother of a friend of mine, his name is right there on my friend list, Herb Wright! Herb, his mother, Carrie, and sister Irene came and took me downtown Atlanta for a day of shopping and the friendship we forged that day has lasted for all of these years. Herb, who was very young, loved to watch me play the Hammond and I like to think maybe I inspired him which makes me proud to say that he is a fabulous musician now! I am happy to report that I was not embarrassed that Easter, so delayed thanks and accolades to them after all these years. The next most important Easter memory I have is the one that came on my daughter’s one-month birthday, and I had her dedicated to the Lord! 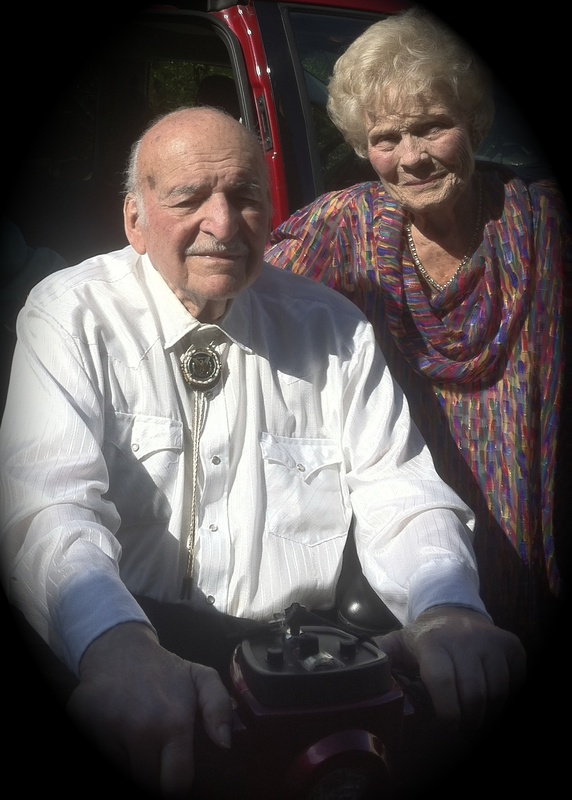 Lastly I am thinking of Easter one year ago, as my dad rolled his scooter out of the van to go into the church I stopped him and took a picture of him with my mother…how different it is today. I am wondering what might change between now and next year? All I know is that the risen, resurrected Jesus Christ holds my future in His hand and I am feeling pretty well blessed right now on this Easter 2014. Previous Post Previous post:RESURRECTION DAY! Next Post Can you answer this question? I like this as I was sitting here laughing but each year you stated brought back memories of my own life. I don’t think I missed an Easter Sunday service till 1962 while working in Seattle at Boeing. We were working 13 days then one day off for months. I remember one Easter (I was about 11) where Mother had made a complete matching outfit for my brother & I. We had received new black & white saddle oxfords. This bratty kid my age kept trying to step on my shoes & mess them up. All during Sunday School class I kept him away. But between class & the service he stepped on my right shoe. For the first time (& never again) I laid him on the floor flat of his back with a right cross to his chin. My Dad saw it happen & I thought I was dead. The kid went crying to his Mother that I had hurt him. I had as his jaw was already turning black & blue & swelling. The Mother came after me but Dad stepped in & told her what had happened & that it would happen again unless he left me alone. He asked her if she wanted to buy me a new pair of shoes to replace the ones he had damaged. She didn’t talk to my folks for months & her kid stayed away from me from then on. I surprised myself by my actions & couldn’t believe I actually got away with it without getting a solid belt beating. I never raised my hand in Church since that Sunday. I also think about your question a lot. Who is next? In the past 14 years I have lost so many family members & friends it just gives me a sense of loneliness at times. But I think where they are at this time, how much joy & pain free life they are enjoying, & the fact I know I shall see them soon & then I start getting homesick for Heaven. Think about the all joy we will have when we see Jesus.& then get to hug all the family that are there. Gonna be a great time…Sometimes I just think take me now Jesus so I can have time to celebrate with my family & friends before we are changed in that nano-second at the trumpet. But life is not mine to do with as I have given it all to Jesus for His direction. Love you- God bless you.